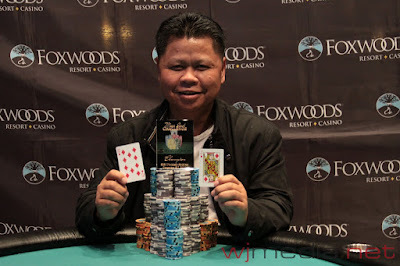 Justin Tseng Wins the $200 Bounty Event! The final six players in the $200 NLHE Bounty event came to an agreement on a chip chop. Justin Tseng held the chip lead at the time of the deal is officially the winner. The 11 remaining players are now on a 10-minute break. $200 Foxwoods Bounty Now Streaming Live in HD!!! Click "Watch LIVE Video" at the top of the page to view the live feed of the featured table. The 24 remaining players are now on a one-hour dinner break. The Bubble Bursts in the $200 Bounty! With 32 players remaining and top 30 spots finishing in the money, we just lost three players on the same hand. Those three players will split the 30th place money of $298. The feature table of the $200 NLHE Bounty event is now streaming live. The final 58 players in the $200 NLHE Bounty event are now on a 10-minute break. With 87 players now remaining in the $200 NLHE Bounty event, the average stack is just under 45,000. We had a total of 259 players in the $200 NLHE Bounty Deep Stack $15,000 Guaranteed event. The players in the $200 NLHE Bounty Deep Stack event are on their first break of the day. There are over 250 players in today's event. The final numbers and prize pool will be posted shortly. $200 Bounty Deep Stack Event Underway! The $200 NLHE Bounty Deep Stack event at the December Mega Stack Challenge is now underway. Players start with 15,000 in chips and levels are 20 minutes in length. There are already over 200 players registered already with registration open through the first two levels. 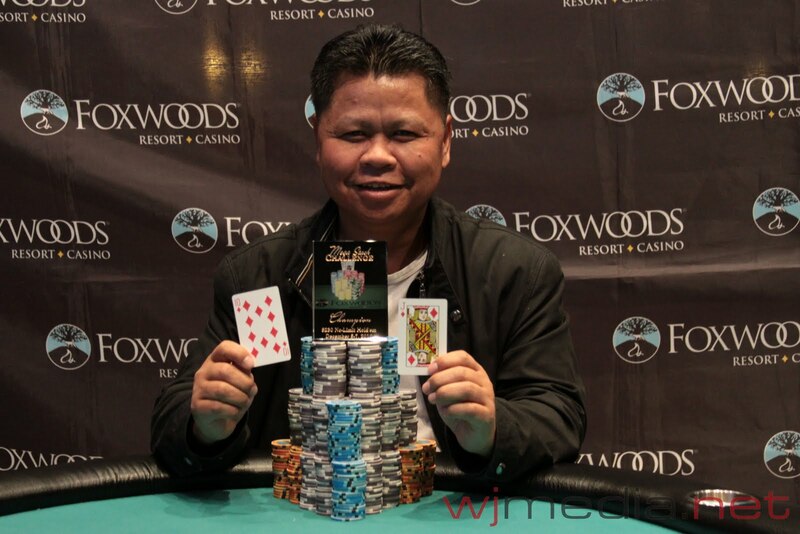 Khenh Chanthamal Wins the $230 Mega Stack! When we reached the final table, the final ten players agreed to a deal to give all players $5,230 and the final two spots would get the difference. Once play was three-handed, Khenh Chanthamala, Devin Misarti and Jacob Pigeon came to an agreement on a three-way re-chop. Chanthamala was the chip leader at the time of the deal and is officially the winner of the $230 NLHE Mega Stack Challenge Re-Entry event! With six players remaining, the average chip stack is now 434,500.